As some of you may know, I'm a regular player of Blizzard Entertainment's multiplayer collectible card game, Hearthstone: Heroes of Warcraft, and I am looking forward to the upcoming release of the new expansion, Knights of the Frozen Throne. This card review will proceed much like my previous series of card reviews, for the expansion Whispers of the Old Gods, though hopefully with fewer bizarre errors regarding which cards were in Standard vs. Wild collection. For this outing, we're going to look at a bunch of neutral cards that have been released so far. 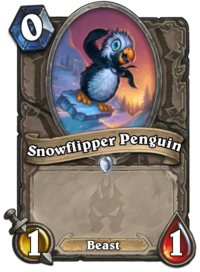 Not sure how a "scalebane"
The Snowflipper Penguin is a pretty tiny card. There's not really much to say about it. A 1/1 for 0 Mana with Beast synergy isn't the worst thing ever... but it's not much better. If you're running a deck that floods the board with cheap minions, you'll probably have better choices all around. This card rates Terrible all around. 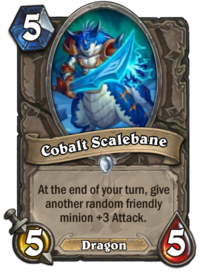 The Cobalt Scalebane is a bigger minion, at 5/5. Plenty of 5- and even 6-Mana minions have that statline, so it's not terrible in that regard, although it's not particularly inspiring. It's triggered ability is decent, but because it happens at the end of your turn, your opponent has a chance to respond, potentially resulting in your wasting your turn playing this minion. Decks lacking easy removal or transform effects might struggle to deal with minions buffed by this card, I suppose, if it's buffing minions with high Health ratings. Overall, though, I don't think it's enough to keep this from rating as Terrible in Constructed. 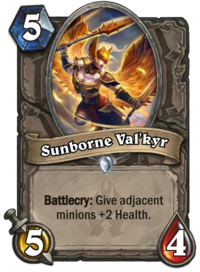 The Sunborne Val'kyr helps to keep your board alive by buffing the health of adjacent minions. An extra 2 Health can often make a big difference. That being said, 5/4 isn't the best statline for a 5-Mana minion, and the ability, at least in my view, doesn't make up for it. So this card merits a Terrible rating overall. The Necrotic Geist is one of the undead of the Scourge. It complements decks that flood the board by spawning minions whenever one of your existing minions dies (whether on your turn or your opponent's turn). You'll probably feel bad playing this card against any deck with decent board clears, which is almost any deck that isn't a rush-style deck, unless you can play it, generate a bunch of ghouls, and then buff them all. Its hefty cost makes that a little difficult, and its fragile 5/3 statline means you can't really be sure it will last if you can't combo it with buffs right away. So, while board-flood druid decks might find a home for it, I'm going to rate it Terrible. 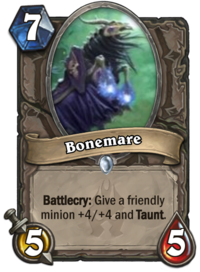 The Bonemare is a pretty expensive card at 7 Mana. For that cost, you're getting a 5/5 body, which is pretty poor, but a really hefty buff. By way of comparison, the Paladin spell Blessing of Kings grants a minion a +4/+4 buff for 4 Mana. So, in a sense, for 3 Mana over the spell, the buffed minion is getting Taunt and you're putting a 5/5 body on the board. While that is actually decent value, this seems like a pretty slow card. The kinds of decks that it's strong against will have won or lost already by the time you can play it, and other decks will usually have an easier time dealing with both this minion and its buffed ally. I'm rating this Poor in Standard and Terrible in Wild. Now, let's have a gander at a few rare cards. At least he's not a mindblower! but that was already taken. 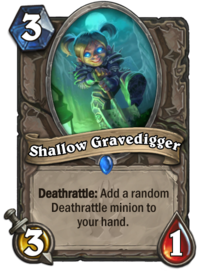 The Shallow Gravedigger is, at first glance, an interesting card. However, it suffers from a number of problems. First off, its statline: 3/1 is really fragile. Second, its deathrattle doesn't spawn a minion on the board, or draw a card from your deck: it adds a random minion to your hand. In Wild, you've got a fighting chance at getting something amazing, but in both formats there's a lot of crap you could end up with. Maybe this card should have had a Discover mechanic attached to it. I'm not sure. Anyway, not even the potential for extra Piloted Shredders in Wild gets this anything better than Terrible. 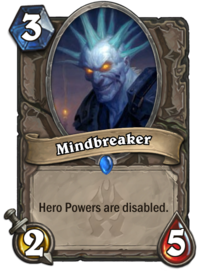 The Mindbreaker is a curiosity of a card. 2/5 for 3 Mana isn't fantastic, but has okay survivability. Of far more interest is the effect. Although I rather like the idea, I'm not sure how well it pans out. Most classes can get by without their hero powers for a turn or two. Perhaps the class that would have the hardest time with this card if it can't deal with it right away is hunter, whose hero power is a key part of its aggressive gameplan. All in all, though, there are so many better 3-cost cards out there, that I can't see my way to rating this better than Poor for the possible niche use. 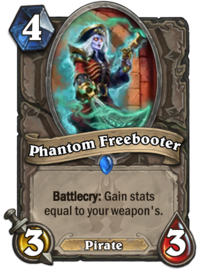 The Phantom Freebooter is a take on a classic archetype, the ghost pirate. This freebooter seems like a natural fit in Pirate Warrior, who likes to buff weapons, although it's tough to say what you'd take out to fit it in. It could, in theory, work in a Paladin deck and Warrior sans other pirates, since both classes run strong weapons, but this seems like a poor niche use of the card. As another flaw, where at least you could play Bloodsail Raider with no weapon equipped and at least get half-decent value for your Mana spent, this card is a really poor choice in that circumstance. Overall, I'm going to say this card nets a Poor rating. 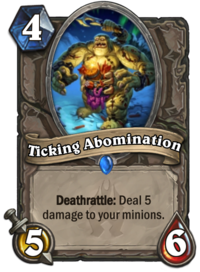 The Ticking Abomination is a big body for its cost (5/6 for 4 Mana), but one that comes with a really steep drawback. By comparison, a similar minion, the Hungry Dragon, rarely saw play despite a far less serious drawback. I've seen talk of a niche use for this card in egg decks, but the usual (and, in my view, far better) strategy for those decks is to buff the eggs before "hatching" them so they can trade with enemy minions or force opponents to "hatch" them using their own resources. Also, you'd be mad to use this in a deck with N'Zoth. So with that said, this card is just Terrible. Now, let's look at some epic neutral minions. She wants what her friends have. Or, at least, my shoelaces. You'll feel pretty bad if the Corpsetaker is one of your last draws of your deck in a game, but for the first half of a game, you can actually get some decent abilities out of it. It's probably only going to consistently see play as a Paladin card, since Paladins have plentiful access to Taunt and Divine Shield. With the likes of Al'Akir the Windlord, some Shaman decks might find a niche use for this card. Its 3/3 body could pose a problem, though. Assuming you've built your deck to take advantage of this card's ability - especially the Lifesteal keyword - I think there's a case to be made for this card's inclusion, but it doesn't seem to me that it's an obvious choice. A Taunt minion with Divine Shield and Lifesteal could hold the line against aggro decks, especially ones that run tokens. 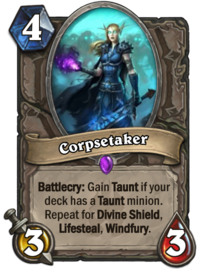 As such, I think we can give Corpsetaker a Fair rating, although probably only barely so. As the caption I wrote up made note of, the Meat Wagon was an iconic part of Warcraft III, which, writing frankly, makes its Hearthstone implementation rather disappointing. Unless you plan on buffing this up, the only minions you're likely to play that it could call up are the Doomsayer (and why would you waste a deck slot and 4 mana to summon a Doomsayer for free?) or, in Wild format, the Summoning Stone. 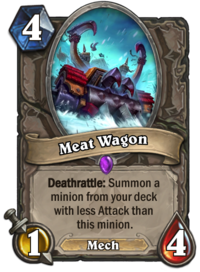 While this latter combination actually does have some value (in that you could kill off the Meat Wagon to summon the Stone and spend all your mana on spells that turn), it suffers from the same problem of having the Meat Wagon take up a spot in your deck. If you do run this in a deck with buffs, you'd probably have to run just the right buff in order to call up specific, game-changing minions, but this seems extremely finicky and difficult to pull off properly to me. All in all, this card gets rated Terrible. 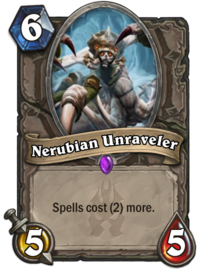 Lastly among the epic cards, there is the Nerubian Unraveler. As I've noted already, 5/5 in stats for a 6-Mana minion is quite normal to see. So the question is, what is the additional effect? And in this case, the answer is, "not good enough". If you have any spells, you usually don't want them to be more expensive. In addition, your opponent can usually still cast a spell if they really need to by turn 7 on. In Wild, you're almost certainly better off playing Loatheb. All that said, there's a potential niche use with a card such as Atiesh, and it could throw decks that rely on cheap spells, such as Miracle decks, off their game. (One card review article I read suggested a card like this could see use if a "sideboard" mechanic, similar to that in use in Magic: The Gathering, were introduced to Hearthstone.) Overall, this card might just have a niche enough place to merit a Poor rating. 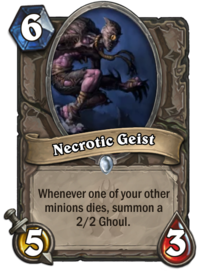 To wrap this post up, let's look at the neutral legendary cards revealed thus far. He's got some serious shoulder pads. neck are a nice touch. of the Scourge, if you ask me. I'm just going to say that all three of these cards are, in my estimation, severe disappointments. They all have in common the "plain" statline (where both Attack and Health match Mana cost), so all the value to be had is found in their additional effects. And there we find they fall badly short of adequate, except possibly in some very exotic builds. 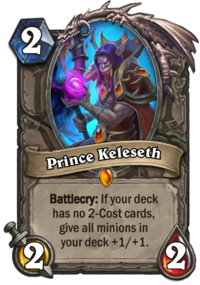 Prince Keleseth is perhaps the worst of them, although that's not saying much. Aggro decks usually need 2-cost minions, and even slower decks run many 2-cost spells. Possibly a "highlander" deck (that is, a deck, in homage to the films and television programmes of the same name, running only a single copy of each of its cards) could find a way to make it work, although there are so many high-quality 2-cost cards that I'm hard-pressed to justify not including any of them for the sake of buffing all the minions remaining in your deck. 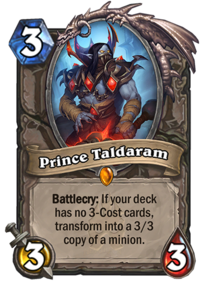 Prince Taldaram is a worse version of the Faceless Manipulator, a card that already doesn't often see play. It's only upside compared to the Manipulator is its cheaper Mana cost, meaning you can combine it with more cards straight away. The only eligible targets are cards whose value aren't derived mainly from their stats, because Taldaram doesn't copy those. 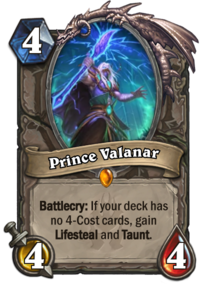 For his part, Prince Valanar is just as disappointing as the others. Just for comparison, the Paladin legendary Wickerflame Burnbristle just gets Lifesteal and Taunt for free as a 2/2 for 2 Mana. If you run buffs, especially the pile of Grimy Goons mass-buff cards that Paladin gets (such as Grimestreet Enforcer), Burnbristle's value just goes up and up, while Valanar's remains rather conditional. You could probably make one of these cards work in a deck, but it would be rather finicky and unreliable, especially since their effects aren't all that game-changing (although Taldaram copying Ragnaros the Firelord or Sylvanas in a Wild match could be decisive). Because of that, they all rate Terrible, unless by some chance more cards are introduced that support their style of play. So, there you have it. Not a terribly encouraging start, I must say.